Like other reviewers here, I was expecting a thicker towel. The edge binding is pretty rough, too. These would be OK for grimy work, or maybe for removing coarser polish. These towels are OK, not anywhere near as thick as I was expecting. The picture they post of the item is deceiving, If it didn't cost so much, I'd return them, but it just isn't worth the time and effort. ConsNot much different than the ones I could buy at WalMart for less money. Merchant Response:Daniel, Mango Towels are best suited for the jobs where you don't want to use your thick, plush microfiber towels - like door jambs and engine bays. 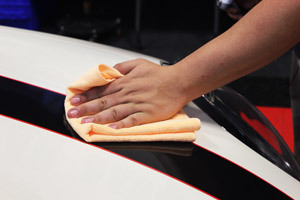 Consider the Miracle Towel or Super Plush Deluxe for wiping off waxes and polishes from paint.